Most medical students major in the ‘hard’ sciences to prepare for medical school. College majors such as Biology, Chemistry, and Physics provide a foundation for the intense research and clinical work to be done in preventing, diagnosing, treating and curing diseases. However, I majored in Philosophy because I wanted a different type of foundation for the work that I do. My work is very different from the type of Medicine most people are accustomed to. The familiar type of Medicine can be off-putting for individuals with disabilities, because there is often a said or unsaid feeling that the disability defines the patient and it must be cured and/or that a person is broken if curing the disability is not possible. It is up for debate how common this is, but it most certainly happens. That fact saddens and angers me, because Medicine can and should rise above such falsities. 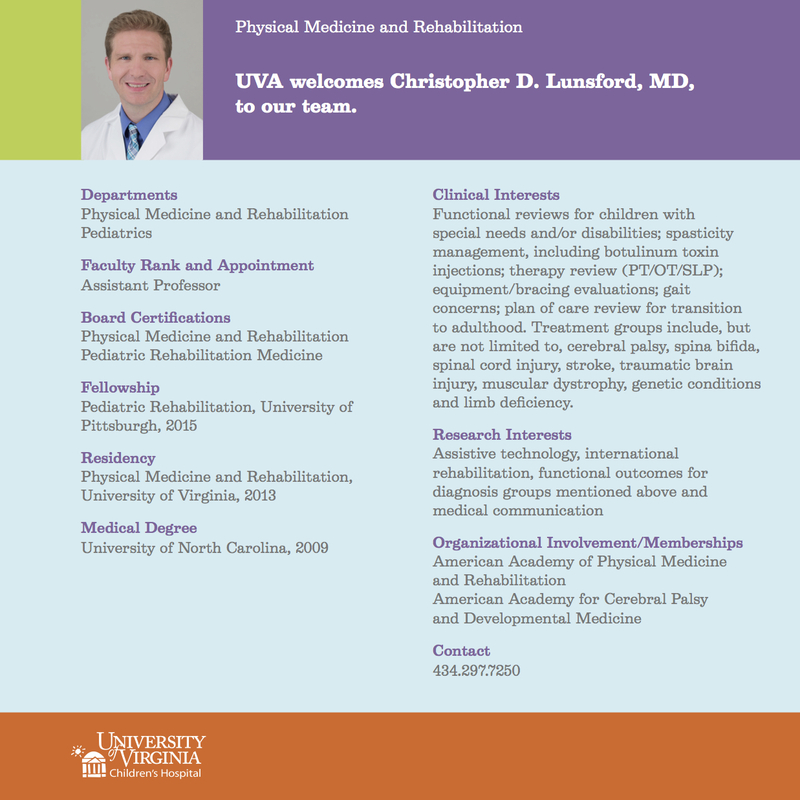 I am the only Pediatric Rehabilitation Medicine (PRM) physician at the University of Virginia. Why only one PRM physician? Because there are so few of us in the country (5 licensed in VA; 237 licensed nationally). Before I came to UVA to practice in 2015, there had never been a Pediatric Rehabilitation doctor practicing in Charlottesville. PRM is a sub-specialty of Physical Medicine and Rehabilitation, another field most people haven’t heard of and no, it’s not the same as Physical Therapy. The PRM subspecialty uses an interdisciplinary approach to address the prevention, diagnosis, treatment, and management of congenital and childhood-onset physical impairments including related or secondary medical, physical, functional, psychosocial, cognitive, and vocational limitations or conditions, with an understanding of the life course of disability. Given this quite technical description, it would be quite possible to miss the fact that an important word is missing: curing. I don’t cure conditions; even if there is a curable aspect to a condition, I am not the physician my patients would consult regarding that cure. To reduce the long description above to its essence, we can say that I treat to maximize function and quality of life. As an example, I work with kids who have conditions like cerebral palsy to decrease the impact of high muscle tone on patient and family identified goals such as walking or self-feeding. The PRM official announcement letter is attached to this post, and while I see a large number of diagnostic categories, it is worth noting my practice is not focused on conditions where the primary obstacles are related to a developmental or behavioral condition such as autism or ADHD. I am a problem solver especially trained to solve problems of differently-abled individuals who are still growing up. While I respect the science of medicine, my sub-specialty, more than most, relies on the art of medicine. If you have the time and interest, you may want to google “art of medicine” and disability and read the first several hits. While I do not claim to have all the answers to questions raised by this subject, I am immersing myself in those questions, hoping to find one answer at a time. My work at UVA is still taking shape. I am technically filling a void and finding gaps in the care continuum for my kids, but that sort of meta-speak doesn’t truly explain the value of my work. I would be remiss not to make it clear that UVA has offered amazing care to these families long before I got here. The amazing team of developmental pediatricians, primary pediatricians, pediatric orthopedists, pediatric neurologists and others have been in Charlottesville caring for these kids and their families for years. Their work overlaps with mine in many ways, which makes my job both very difficult and very rewarding. The difficulty is making sure not to replicate what someone else is doing; the reward is finding that new goal to work on. I am a jack of all trades, master of none, for pediatric disability. Modern medicine has gone to the extreme on valuing specialty care and the care of rare pediatric conditions is no exception. However, patients can have over 10 doctors following different aspects of a condition, and coordination of all of that disjointed care most often falls on the families. The irony is that while my career path opportunity is also a product of the super-specialty push, my training is to look at and value the whole child when making my treatment plan. I often tell my families, “I may not know the answer, but I probably know who knows the answer.” In that way, I use my ‘master of none’ status to the benefit of my kids. What is the best role for a Pediatric Rehabilitation doctor in a place like Charlottesville? While I’ve been in Charlottesville for just over two years now, I can’t say I truly know the answer to this question. It’s an organic and individualized process. I think I could answer what role I should play for a specific patient much easier then what role PRM should play in Charlottesville now and in the future. Do we need more doctors like me? Perhaps, but the quality of relationship between disability and pediatric medicine isn’t just a function of how many PRM doctors we have here. Every day, I think we are striving to become more person/family first as well as more disability positive. There are many efforts helping us get there such as this blog and other groups at UVA, but we could benefit from even more. Function and quality of life. Who can argue that these are important to medicine? And yet, how often do we feel like our doctors don’t help us with what’s important to us? I am a patient and a person with a disability as well, and I am frustrated with our medicine system’s inability to meet my needs at times. I try to remember that frustration when I see my families. Medicine isn’t perfect and never will be, but putting patients first in order to find ways to help is worthwhile. That’s the mission of my Pediatric Rehabilitation practice in Charlottesville. 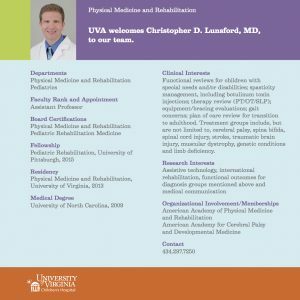 Dr. Lunsford is an assistant professor in the Department of Physical Medicine and Rehabilitation and the Department of Pediatrics at the UVA Health System. He has been an attending physician with these departments since 2015. He is a member of the American Academy of Physical Medicine and Rehabilitation (AAPM&R) and the American Academy of Cerebral Palsy and Developmental Medicine (AACPDM). He is also one of the co-chairs of the pediatric neuromuscular conference that occurs every December at UVA.